This is the hardcover first edition from P-type Publishing which uses spot red ink throughout. The edition more widely available through standard booksellers from Rockport Publishers does not use spot ink. For centuries, designers have chosen type styles to convey unique expressions and to make their work stand out. Today’s computers provide a selection of fonts that serve reasonably well for workaday letters and publications, but have become utterly boring from overuse. If you want your project to attract the reader’s attention you need an original font. Independent type designers have devoted their talents to producing fresh new fonts that can give your text a major boost. Indie Fonts provides a showcase collection of almost 2000 diverse fonts from 18 of today's hottest digital type foundries and features the best work of these designers. Indie Fonts will help you find some of the highest quality fonts available today. In the early 20th century, type reference books provided users with samples from the major monolithic type companies. This book is styled after those classic tools, but features independent firms whose fonts, like their names, are unique. You will discover such foundries as Letterror, PSY/OPS, and Test Pilot Collective, alongside P22 type foundry, Font Diner and Astigmatic One Eye Typographic Institute. The type styles range from the best of Matthew Carter’s classic designs to the latest irreverence of Chank Diesel. Designers searching for unique typefaces will find what they are looking for, whether historical revivals or futuristic techno faces. The book’s fully cross-referenced index of type designs and designers, accompanied by one-line illustrations of the fonts for quick reference, expedites the search. Direct access listings to the foundries‚ websites and phone numbers, allows the user to put any remaining questions directly to the type designers! (Don’t be shy—they're expecting your call.) Also included is a helpful glossary of typographic terminology and quick reference charts so you can track down those unusual characters required in many languages, such as å, é, î, ø, and ü, and sometimes ß.
Indie Fonts comes with a companion CD-ROM, worth far more than the retail cost of the book—featuring 33 representative fonts from the book's independent foundries (fully licensed and ready to install). Searching the web and looking at pixilated web images is not a satisfactory way to find the best type for your needs. Using this book and CD-ROM is a far better method to find unique fonts—from the extremely useful to the surprisingly experimental. Indie Fonts is a must-have for designers, artists, aesthetes, publishers, advertisers, and hobbyists—in fact, for anyone with something to say. "...while on the Subject of Fonts Dept. : Yes, I've been digging around the Web for unusual fonts. Type free fonts into Google and you too can lose a night's sleep downloading. But the best fonts are seldom free. One of the most aggressive new type foundries is P22 out of Buffalo, New York (www.p22.com). This company is worth following. P22 recently released an excellent book called Indie Fonts, with 2,000 font samples from 18 different independent foundries, along with 33 free fonts on a CD. The book is $39.95, and I highly recommend it." "Bottom Line: Must-have for any font enthusiast or designer "
"Indie Fonts" is primarily a type specimen book culled from 18 font boutiques, such as Altered Ego Fonts, Carter & Cone Type, LettError, Typeco, and P22, the foundry that put the book together. 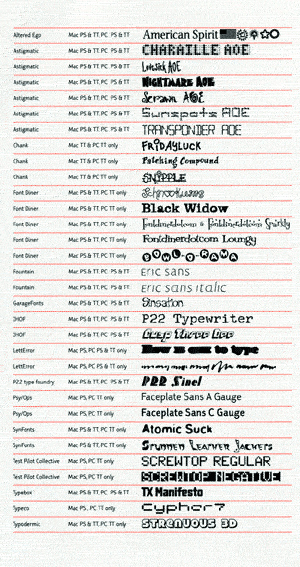 (Most of these companies can be found in the Fonts department on creativepro.com). The book contains more than 400 pages of type, fully indexed and cross-referenced by name, type style, and designer. A helpful glossary of type terms is also included. Tacked to the inside back cover is a CD-ROM of 33 typefaces that you can actually use (as long as you are the owner of the book and therefore the licensee). The book's design reminds reminds me a little bit of the graphic style popularized by Meta, the Berlin-based design shop -- spare, clean, and punctuated by red bars with reverse type. The production values are high, in line with its $39.95 sticker price. (You can order the book on P22's Web site.) 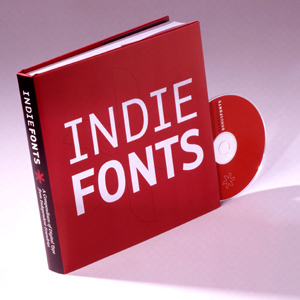 But to me "Indie Fonts" is more than a type specimen book. It's also a yelp of independence. The retail type business is not lucrative, and consolidation has been necessary as companies band together for survival. It's reassuring to see that small foundries are still out there, doing their thing outside the mainstream. They inject vitality into the market, leading to more innovative graphic design overall. And that's a good thing. As the editors say in the introduction, "please design safely." When I opened the package I was knocked out -- this is a hard-bound book, superbly designed and printed on heavy coated stock -- complete with CD-Rom which showcases nearly 2,000 fonts from 18 of today's hottest digital type foundries! You no longer have to spend countless hours on the web looking at digitized samples of fonts for inspiration or acquisition. You just thumb your way through this book. Most surprising was the discovery that Tayme Riggs, formerly our font guru from Phil's Fonts -- and frequenter in the Design Cafe list, is one of the editors of the book. So you know it's got to be good. This is not just a font reference or samples book either. All through the book you find exquisite layouts and designs which feature the fonts. It's as much a designer's inspiration as it is a font shopping mall. Best of all you get 33 representative fonts from the book completely free and ready to load and use. WOW. The price is $39.95, including the free fonts, it's hard bound with over 400 luscious pages of font heaven. Watch for our complete review in the &Type department, or go and get one NOW!